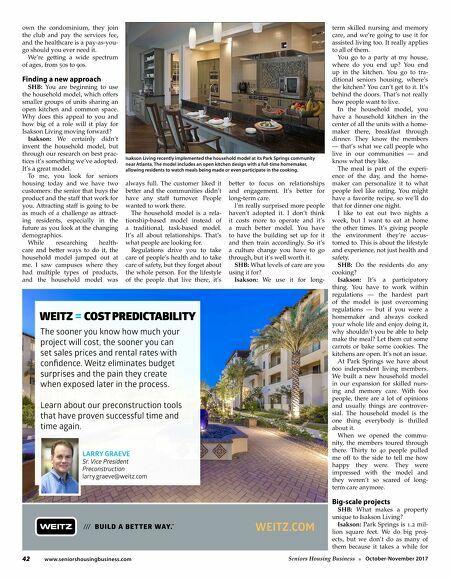 42 www.seniorshousingbusiness.com Seniors Housing Business n October-November 2017 WEITZ.COM WEITZ = COST PREDICTABILITY LARRY GRAEVE Sr. Vice President Preconstruction larry.graeve@weitz.com The sooner you know how much your project will cost, the sooner you can set sales prices and rental rates with confidence. Weitz eliminates budget surprises and the pain they create when exposed later in the process. Learn about our preconstruction tools that have proven successful time and time again. own the condominium, they join the club and pay the services fee, and the healthcare is a pay-as-you- go should you ever need it. We're getting a wide spectrum of ages, from 50s to 90s. Finding a new approach SHB: You are beginning to use the household model, which offers smaller groups of units sharing an open kitchen and common space. Why does this appeal to you and how big of a role will it play for Isakson Living moving forward? Isakson: We certainly didn't invent the household model, but through our research on best prac- tices it's something we've adopted. It's a great model. To me, you look for seniors housing today and we have two customers: the senior that buys the product and the staff that work for you. Attracting staff is going to be as much of a challenge as attract- ing residents, especially in the future as you look at the changing demographics. While researching health- care and better ways to do it, the household model jumped out at me. I saw campuses where they had multiple types of products, and the household model was always full. The customer liked it better and the communities didn't have any staff turnover. People wanted to work there. The household model is a rela- tionship-based model instead of a traditional, task-based model. It's all about relationships. That's what people are looking for. Regulations drive you to take care of people's health and to take care of safety, but they forget about the whole person. For the lifestyle of the people that live there, it's better to focus on relationships and engagement. It's better for long-term care. I'm really surprised more people haven't adopted it. I don't think it costs more to operate and it's a much better model. You have to have the building set up for it and then train accordingly. So it's a culture change you have to go through, but it's well worth it. SHB: What levels of care are you using it for? Isakson: We use it for long- term skilled nursing and memory care, and we're going to use it for assisted living too. It really applies to all of them. You go to a party at my house, where do you end up? You end up in the kitchen. You go to tra- ditional seniors housing, where's the kitchen? You can't get to it. It's behind the doors. That's not really how people want to live. In the household model, you have a household kitchen in the center of all the units with a home- maker there, breakfast through dinner. They know the members — that's what we call people who live in our communities — and know what they like. The meal is part of the experi- ence of the day, and the home- maker can personalize it to what people feel like eating. You might have a favorite recipe, so we'll do that for dinner one night. I like to eat out two nights a week, but I want to eat at home the other times. It's giving people the environment they're accus- tomed to. This is about the lifestyle and experience, not just health and safety. SHB: Do the residents do any cooking? Isakson: It's a participatory thing. You have to work within regulations — the hardest part of the model is just overcoming regulations — but if you were a homemaker and always cooked your whole life and enjoy doing it, why shouldn't you be able to help make the meal? Let them cut some carrots or bake some cookies. The kitchens are open. It's not an issue. At Park Springs we have about 600 independent living members. We built a new household model in our expansion for skilled nurs- ing and memory care. With 600 people, there are a lot of opinions and usually things are controver- sial. The household model is the one thing everybody is thrilled about it. When we opened the commu- nity, the members toured through there. Thirty to 40 people pulled me off to the side to tell me how happy they were. They were impressed with the model and they weren't so scared of long- term care anymore. Big-scale projects SHB: What makes a property unique to Isakson Living? 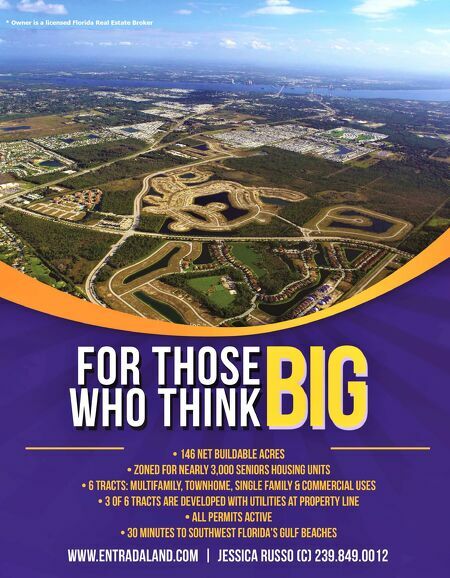 Isakson: Park Springs is 1.2 mil- lion square feet. We do big proj- ects, but we don't do as many of them because it takes a while for Isakson Living recently implemented the household model at its Park Springs community near Atlanta. The model includes an open kitchen design with a full-time homemaker, allowing residents to watch meals being made or even participate in the cooking.